Hi guys I'm starting my quest to all dream world pokemon I'll be offering my regular Pokemon and my dream world Pokemon. DNA: DW Vulpix, DW Abra and DW Bagon for Deoxys (speed) and shaymin. Last edited by MikotoNakadai on Mon Mar 11, 2013 1:17 pm, edited 15 times in total. I can get you the Manaphy and do a tradeback for Deoxys. What do you have to offer in exchange? Are all of them legit or are any hacks? I'll take the crown beast, which one is it btw? I should be available at the start of next week to trade. What times are generally best for you? I have de 3 beast. Alright, I'll take the Raikou. I'll have a more definate day once my boss lets me know his scheduale and I get in touch with my buddy so I can use his router. But from sunday-wednesday around this time this upcoming week sound good to you? Which DW pokemon do you want? any one not on your offering list? I have several I can trade that are not on that list. Oh, and I want your DW porygon. I'll trade any DW pokemon you want, if I have it. My FC is in my sig. Last edited by Charr on Mon Sep 17, 2012 8:33 pm, edited 1 time in total. 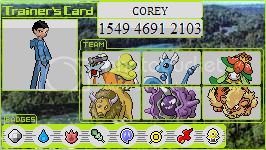 I may be interested in your Giratina(s), Deoxys, and Shaymin. Are they UT? and what are their natures and IVs (if you know them)? I've got an abundance of DW stuff so it shouldn't be too difficult to get stuff for you. @CharrNot not being in my offering list will be accepted, or send me a PM with a list of your pokemon to I choose. @DNA All them are legit, UT and in a Gen 4 game 2 in my Diamond and 2 in my Heart Gold. How much would you value each legendary at? 3 DW females? or maybe less if the DW is a bit more valuable (e.g. Vulpix)? I'm willing to negotiate. The Vulpix take 1 legendary the other take 2 Pokemon. Just to check, you take only the Deoxys and shaymin. Just to clarify, your Pokemon are legit right? And it's not cloned right since I see cloning as cheating? @Karima I'm about to get a Manaphy for this week, I can exchange with you next week. All my pokemon are legit and UT. I'm trading a legendary for two normal, if it's okay for you so we can make the switch. @DNA I saw your list and decided for the Abra with 31 SPD IV, the bagon with 31 SPD IV and the Vulpix already cited. ...because I didn't see any Bagon with a 31 Speed IV that I possess. I'm assuming that's what you meant. Either way, I agree to that trade. When are you best available? sorry, it was that's what i mean to say. This time every day for me is good. then in return, I'll trade you the 3 DW females in the Gen 5 game for 3 other random junk Pokemon. I'll get that set up before Wednesday. I will post in this thread when I am ready and logged on with the trades. Right. No prob for me. I want the Manaphy instead of the Shaymin then. Just tell me which of my Pokemon you want. Oh, and can you tell me around what time you want to trade. I live in Indonesia so there's that time difference.